Who is a wanderer? The spirit, which travels and yet travels not, which is far and near as well, which resides within and without – says the Isha Upanishad. In the same vein, the Jaina dictum says – The medium of motion (dharma) provides movement to the spirit (and matter); otherwise the universe would come to a stand still, like water helping the motion of fish. Similarly, the medium of rest (adharma) provides steadiness; otherwise there would be no stability in this universe, like the shade of a tree providing rest to the weary travellers. The spirit wanders from one birth to the next, moving on and onwards, a seemingly endless search, searching for that which is in one’s own being. Like the kasturi deer, which is intoxicated by the fragrance and jumps about searching for it, not realizing that the fragrance is within its own being. One can discuss this wandering at many levels, pondering over its geographical as well as metaphysical significance. Particularly motivating are the wanderings of the ancient seers, one of whom was Lord Mahavira whose wanderings were not just to sanctify the Earth, but a journey of the higher realms as well. His wanderings can be interpreted at so many dimensions and levels – because it satisfies the queries at all those levels. It was an era dominated by the caste system, when the common man was in awe of the Brahminical priests, accepting blindly their monopoly and superiority, when Vedic injunctions were followed fearfully, when animal sacrifices were justified for the fruition of the Yajnas, when the Shudras and the women were treated as unequal and inferior, and when religion was manipulated for the purpose of power and dominion. It was an era that saw the vision of the ancient seers and sages being suppressed by the power grabbing leaders who were distorting and presenting their own selfish interpretations of religion. In such a scenario of political unrest and religious disorder, there was a need for a code of conduct incorporated in a vision of peace and non-violence. Such a vision arose in the form of Lord Mahavira – a seer of truth, a fountain of compassion, and whose life was one of seeking and self-realization. This spiritual path which he walked upon, had been sanctified by twenty-three Tirthankaras before him, the 1st of whom was Lord Rishabhadeva and the 23rd was Lord Parshva. This paper will explore the social vision and religious insights of the great teacher through his geographical wanderings. The journey begins at Kundagrama, a splendid city in the heart of Vaishali kingdom near modern Patna in 599 B.C. Born to king Siddhartha and queen Trishla, this divine child was named Vardhamana. At birth itself, he was endowed with Shrutajnana (knowledge of testimony), Matijnana (knowledge derived through the sense organs and the mind) and Avadhijnana (clairvoyance). The presence of these three kinds of knowledge at birth is a remarkable feature of a Tirthankara. Strong and fearless, this extraordinary boy grew up to be kind and religious as well. Detached to the riches and luxuries around him, he remained engrossed in contemplation about the problems of life and the world. He was deeply troubled by the adverse situations prevalent in society. Superstitions, animal sacrifices, inhuman treatment of women and Shudras – awakened a silent revolution in him. At the age of thirty, he embraced the life of a monk. Seated in a golden palanquin, in a magnificent procession followed by thousands of citizens, he moved to the Jnatakhanda garden. There, under an Ashoka tree, after observing a two day fast, he removed his princely attire and wore white robes. He then pulled out his hair by his hands and bowing to the Siddhas, the liberated souls, he initiated himself into the holy order. A princely life was renounced for a life of bareness and tolerance. Pledging to abstain from sinful deeds and tolerating hardships with equanimity, he ventured on the path. Prince Vardhamana became Shramana Mahavira. He was now called Mahavira – the courageous one because of the great vows which indicate his immense inner strength. He now gained the Manah-paryaya-jnana (Fourth degree of Knowledge –Telepathy) by which he knew the thoughts of all sentient beings in a particular space time. This initiation was the end of one path and the beginning of another. The inner journey unfolded. The first phase of his wanderings lasted for twelve and a half years. Engrossed in spiritual contemplation, he was silent most of the time. Determined to overcome the need for bodily comforts, he subjected himself to all kinds of climatic and natural disturbances. Not discriminating between habitable and inhabitable regions, between smooth and rough paths, between safe and dangerous pathways, Mahavira wandered on. Nor did he pay heed to any advice. Steadfast in his vows, engrossed in the contemplation of the self, unaffected by human, natural and supernatural sufferings and tortures, he moved on. There was the Yaksha in Astigrama who tortured him for an entire night by assuming demoniac and animal forms; there was the ferocious snake, Chandakaushik, in Kanakhal, who was a terror in the entire region till his meeting with Mahavira who remained unaffected by his hisses and deadly poison; there was the shepherd in Chamani village who was so angry with Mahavira for not taking care of his oxen, not understanding that Mahavira’s silence arose from meditation, that he hammered nails into Mahavira’s ears. At many places, the villagers were hostile and extremely violent. There are many such other tales during his wanderings, all of deadly tortures, but all borne patiently and unflinchingly. If ever he spoke, it was a language of compassion and wisdom which transformed such cruel hearts. Apart from these soul-stirring descriptions of adversities faced by Mahavira, we also have accounts of the rigorous austerities observed by him while he was engrossed in Sadhana. During this period of twelve and a half years, he ate meagre food for three hundred and fifty days only. He observed fasts for fifteen, thirty and also for a hundred and twenty days at a stretch. Immense was his will power, immense was his equanimity and tolerance. It was an inner peace undisturbed by external forces. It was a conquest over the demands of the body, mind and speech. The final and most painful of all tests was the hammering of the nails into the ears. With that period, the adversities were over. This spiritual hero had defeated the karmic shackles with his army of determination and steadfastedness. He became a Jina, a conqueror. This period of adversities and austerities reached its zenith at Jambhiyagrama on the banks of the Rjubaluka River. It was the tenth day of the bright half of Vaishakha month. Fasting for two and half days, meditating under a huge sal tree in the Godohika (milking) posture facing the sun, this ascetic attained Kevalajnana (the fifth degree of knowledge – omniscience) – a state of infinite knowledge, infinite intuition, infinite energy and infinite bliss. “Now the Venerable ascetic Mahavira became a Jina (conqueror), an Arhat (worthy of worship) and a Kevali (omniscient). He became the twenty-fourth Tirthankara of the present era.” (Kalpa-sutra, 121). Hereafter Shramana Mahavira came to be known as Bhagawan Mahavira. The inner journey unfolded further. The journey here after was that of the teacher, the guide, and the preacher. After attaining omniscience, Lord Mahavira began to give discourses. As before, he wandered from one place to another on foot. From Jambhiyagrama he moved on to Madhyama Pavapuri. There, a Brahmin named Somila was organizing a large religious sacrifice. Several Vedic scholars along with their disciples were assembled there; chief among them was Indrabhuti Gautama. They had all heard of Lord Mahavira’s enlightenment but were disbelieving of it. As soon as Indrabhuti saw Mahavira, Mahavira addressed him, “O Indrabhuti! You have doubts about the self.” How did Mahavira know? Indrabhuti had not uttered a word regarding this doubt about the existence of the soul. So, it is true, thought Indrabhuti, this being is a kevali, one who has complete knowledge about all things of all times. The universe has no secrets from such a being. All is known. All is transparent. Indrabhuti was completely humbled. Equally humbled were ten other eminent Vedic scholars of that gathering who came forward to meet Mahavira, each of them with a different metaphysical doubt lingering in the mind. To each of them, Mahavira first revealed the doubt without their stating the same and then put forward convincing replies. No further proof was required, nothing more was needed to establish Mahavira as a true teacher. Fully satisfied and happy, all of them along with their 400 disciples each, surrendered at the feet of the master. Thus, 4411 initiations took place in a single day. This is the meaning of Tirthankara – one who establishes the Tirtha or the religious order. Thus emerged the religious order of Mahavira – the Chaturvidha Sangha – the four-fold congregation of monks, nuns, laymen and laywomen. Such a magnificent incident reached far and wide and thousands of men and women came to listen to the discourses of Mahavira wherever he went. It is said that not just humans, but animals and birds were also attracted to his discourses. Rich and poor, kings and their ministers, merchants, farmers, craftsmen and all classes of people were sanctified by his sermons. Many became his disciples and followers. The Sangha evolved efficiently under the able administration of Mahavira. 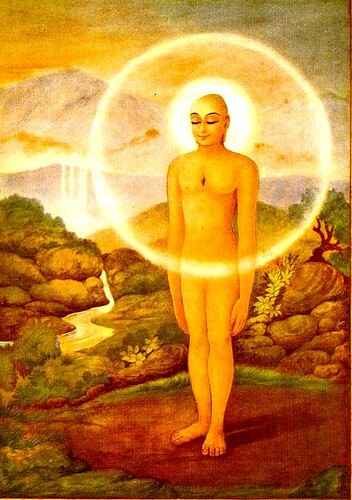 Indrabhuti became the first prime disciple of Mahavira. He, along with the ten Vedic scholars became the eleven Ganadharas. They formed the nucleus of the new order and composed all the rules of conduct and the scriptural literature, which they later narrated to other disciples. The Sangha was instrumental in providing proper guidance to the monks and nuns and in inspiring the laymen and laywomen to look after the monks and nuns. In the Sangha, no distinction was made between men and women, and Brahmins and Shudras. All were inspired, all were embraced, all were transformed. The women being initiated as nuns was indeed a revolution in those times. For Mahavira, it was just a natural culmination of his respect for humanity. The Sangha expanded very quickly. Soon, there were 14,000 monks, 36,000 nuns, 1,59,000 laymen and 3,18,000 laywomen. Their code of conduct consisted of a five-fold spiritual discipline. These are five vratas or vows of non-violence, truthfulness, non-stealing, celibacy and non-possession. This scheme of vows was very strict and rigid for the ascetics called the mahavratas (Great Vows). They were advised not to stay in any place for more than a month except during Chaturmasa (the rainy season) and to wander about only on foot. The householders had to follow the five vows also, but their rules were modified and less strict known as the anuvratas (Small Vows). Their duties extended to taking care of the ascetics, providing a temporary dwelling for them and propagating the cause of religion. This four-fold religious order was a self-governing and self-sufficient system. For thirty long years, this great wanderer moved from place to place preaching the Jaina religion and its code of conduct as a way of life. He visited important places like Kasi, Kosala, Vatsa, Champa, Pancala, Magadha, Rajagrha, Anga, Banga, Kalinga and many others. The Jaina Canonical literature has detailed descriptions of the wanderings of Mahavira and the transformation of the people based on his noble teachings. Thousands of people from various cities and villages and from different walks of life joined the religious order of Mahavira. Bimbisara, the king of Magadha was a Buddhist but his Queen was a great devotee of Mahavira. We find a vivid description of the dialogue between Bimbisara and Anathimuni in the Uttaradhyayana Sutra, which inspired the king to become a disciple of Mahavira as well. His son and minister, Abhayakumar, was also an ardent disciple of Mahavira. Chetaka, the head of Vaishali republic and maternal uncle of Mahavira, greatly contributed in propogating the Jaina religion far and wide. Many kings such as Virangada, Virayasa, Sanjaya, Seya, Siva, Udrayana and Sankha Kasivardhana joined the religious order of Mahavira. The last lap of the great wanderings of Mahavira was Pava. He came here at the age of seventy-two and stayed in the garden of Raja Hastipala. His discourses at Pava are recorded in the Uttaradhyayana Sutra. Here he sat for his last meditation on a slab of stone. It was in the early hours of the fifteenth day of the dark fortnight of Kartika month in 527 B.C. Transcending the wandering cycle of birth and death, this hero of the spirit attained the state of Nirvana and became a Siddha. Click to view more reviews & deep musings on life. We would love to hear your comments and thoughts in the form below. Beautiful words! Great is lord Bahubali!!! This is my first visit to your blog – spent some time reading various posts – but this post stands out. Really well-written!